Degree(s): AA in General Studies, Blue Ridge Community College, Executive Protection Institute (EPI), Advance Work EPI, Sig Arms Protector’s Pistol Defense Program EPI, ASP Tactical Baton Instructor’s Course, Emergency Medical Technician School, VA Department of Social Services Medication Administration Training Program. 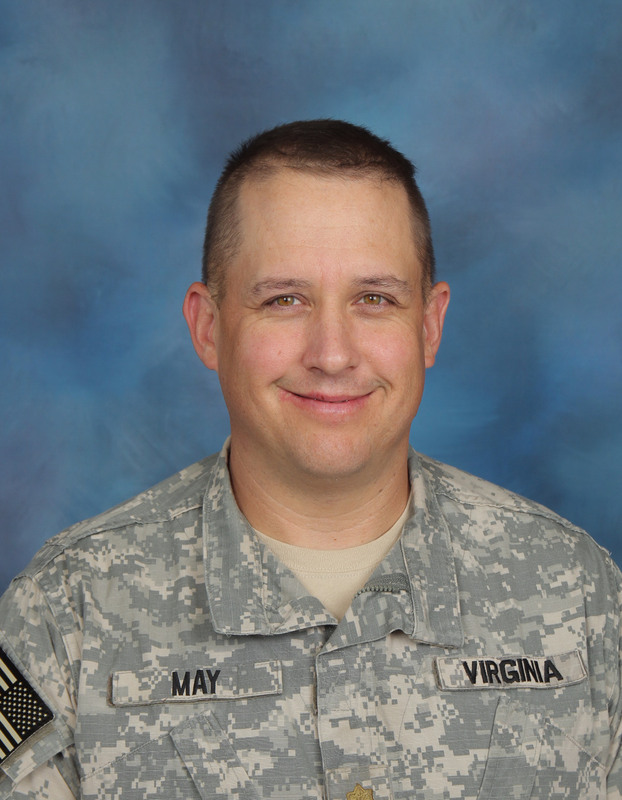 Born and raised in Stuart’s Draft VA, MAJ May currently lives in South East Augusta County. He has two children and attends Cornerstone Church of Augusta. His hobbies are hunting, fishing, and listening to music. 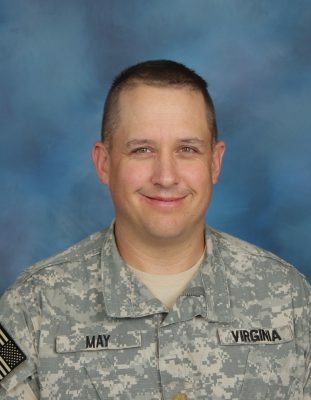 MAJ May enjoys a simple life with no cable, no home internet, and heat w/a wood stove. He says, “I’m blessed w/ a great immediate family and a small circle of friends.” Prior to FMS, MAJ May worked for a fence contactor and did personal protection work. May began working at FMS in October of 2002 and has worked all three shifts through the years. “I have gained wisdom working with dozens of staff and faculty. The experience of working with cadets from around the world is a great challenge and worth it at the end of the day,” he explains. May served four years in the United States Army as an Infantryman and earned the rank of Sergeant E-5. After basic and advanced infantry training at Ft. Benning GA, he served a year w/ Charlie Company, 5/20 Infantry, 2nd Infantry Division at Camp Casey and Warrior Base (DMZ) South Korea. The remainder of his enlistment was at the National Training Center, Fort Irwin CA w/ Delta Company, 1/52 Infantry which eventually transitioned to the 11th ACR. May was a member of the Opposing Forces, trained in Soviet Doctrine, who fought against visiting units from around the country. During his four years, he completed the US Army Noncommissioned Officer Academy (PLDC) at Fort Lewis WA, Opposing Forces Academy, Combat Lifesaver, Unit Conduct of Fire Trainer Instructor/Operator Course, and Bradley Fighting Vehicle Course. I earned M16 Expert Badge, Army Commendation Medal, National Defense Medal, Army Achievement Medals, Good Conduct Medal, Noncommissioned Officer Professional Development Ribbon, and Overseas Service Ribbon.